I think that most of you would agree (if you read this site regularly) that I usually spend most of my time on Android or iOS apps. This is simply because I do not have a Blackberry or Windows Phone device to test with. But now that has changed as a friend has loaned me their Blackberry Playbook temporarily. So for the first Blackberry app to review I chose a time tracking app called Timr. Time tracking is near and dear to my heart because I am a consultant. This means that my time literally is money. If I work 5 hours one night on a client project but only write down 3…then that’s 2 hours worth of money out of my pocket and that’s not a good thing. Therefore, I like to look at various apps to track time. Currently I am using Toggl on my Galaxy S3 but I wanted to look at Timr for Blackberry to see how it works. Now, Timr is a popular app and has been downloaded quite a bit. Timr is available on the 4 major platforms: Android, iOS, Blackberry, and Windows Phone. But we will only be looking at the Blackberry version today. Look for an Android review later. 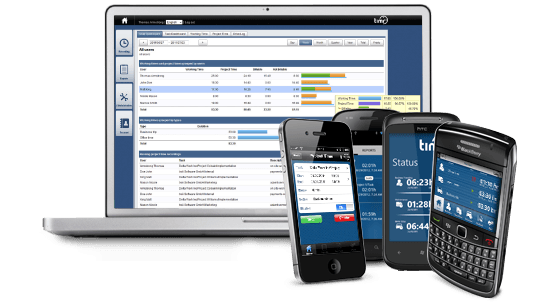 What should a time tracking app do? Well, it should…..track time. Yes, that’s correct!!! Timr allows you to track the time spent working and allows you to break it down by client, project, subprojects, or tasks. This is a big deal and isn’t always a feature for some time tracking apps. Timr gets it right here by allowing you to group your time efficiently. Timr is also a mileage tracker. This is a nice feature and may let you consolidate a couple of apps into one. It can also use the GPS to track your starting and stopping position. Real time tracking is only available in the iOS version. As you can see, that is quite the feature list and Timr is a very handy app. Now, Timr is a paid monthly service. So while the app is free, you will eventually need to pay for the service (after initial trial period). Looks like the cheapest subscription plan is $11/month. This really isn’t a lot considering the nice features you get with Timr. And with a subscription service, you know it is will be updated frequently with new features. Hey Ben, Thanks for the great Review, However have you tried an application called Vezma? It’s a great Mileage expense tracking solution that has helped me a lot in tracking my expenses and also tracking real time location of the drivers/vehicles. You can check em out at http://www.vezma.com, I hope it helps.